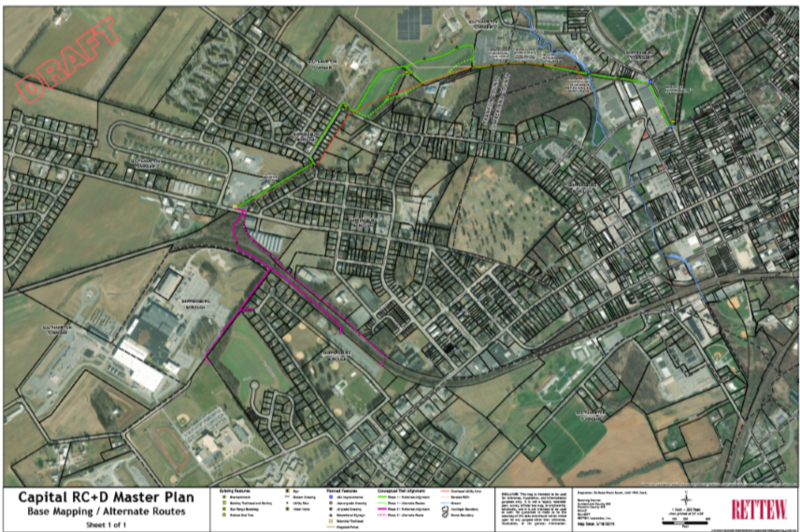 The Shippensburg Community Parks and Recreation Authority (SCPRA) received a grant through Capital Resource Conservation & Development (Capital RC&D) to study the feasibility of extending the Cumberland Valley Rail Trail into Franklin County. A Study Committee made up of SCPRA members, municipal representatives, land owners and interested parties worked with Rettew Associates to explore the possibility of extending the existing Rail Trail from Shippensburg Station to a proposed trailhead at Orrstown Road (Phase 1). The study scope also looked across the rail road track to allow connectivity to Memorial Park, Shippensburg Middle School, High School and Volvo (Phase 2). A general mapping of the study was performed, adjacent land owners were met with, boundaries and limitations were identified. The Concept Map is the result of months of research and discussion with interested parties. A variant of this trail appears to be entirely feasible; however, this map is conceptual only and actual route may alter during the Design Phase. We would love to hear your feedback on the project. Please let us know your thoughts by filling out the form below. We look forward to working with the community and building something great together! Become part of an organization committed to helping our community live a healthy lifestyle. The Shippensburg Community Parks and Recreation Authority is seeking quality volunteers and/or interns to assist in the direction, implementation, and supervision of various youth and adult programs. Programs could include but not limited to education classes, walking club, fitness classes, sports programing, or any program idea the volunteer/intern may have. The ideal Volunteers/Intern will be dependable, energetic, and focused on their program. Assist the Director with preparation, promotion, and oversite of program. Monitor program site and participants during schedule activity. Notify appropriate staff of any unsafe conditions, needed repairs, complaints, accidents, or injuries. Communication with all participant and/or parents of participants. Current CPR/AED certification is preferred. Must have the ability to relate to diverse groups of people on all levels in a friendly, positive, and consistent manner. Must have flexible work availability, including evenings and possibly some weekends. Interested volunteers/interns should submit their name, phone number, email, and letter of interest to SCPRA via email or mail. 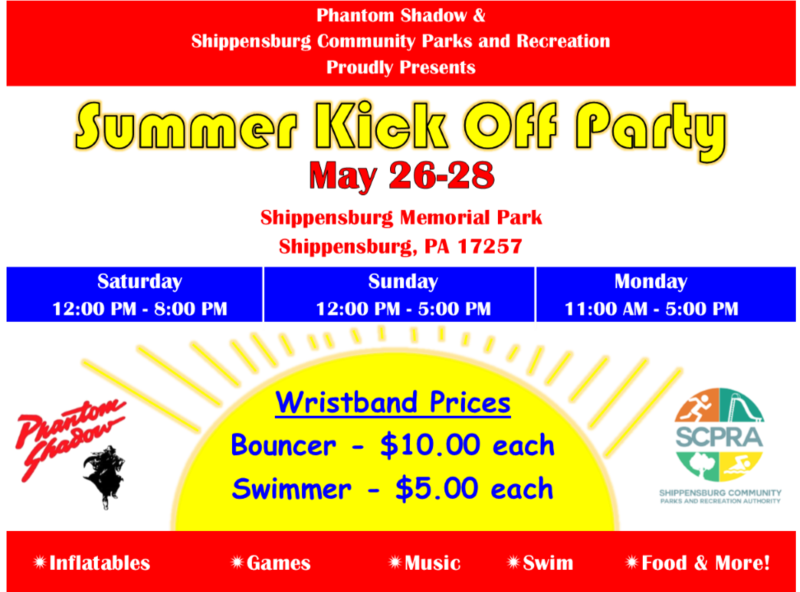 Shippensburg Parks and Recreation Authority is dedicated to providing quality parks and recreation to our communty. We would like your help to determine what additional types of programs, facilities, and services are needed to serve the Shippensburg Community. You can help us by taking a few minutes to answer the following survey. If you would like more information about SCPRA facilities or programs, place cantact us at 717-530-0261 or look up our website at www.shippensburgparkandrec.org. In 2019 SCPRA is offering nature education programs! Most of the programs will be designed for children ages 5 – 12. Each session features a hands-on education activity and at least one related craft. A few times through the year special programs will be offered for the whole family to enjoy. nature journals, & lots more. Costs of sessions will vary depending on the crafts. Parents are welcome to stay and participate with their children. An event this size requires many hands to be successful. 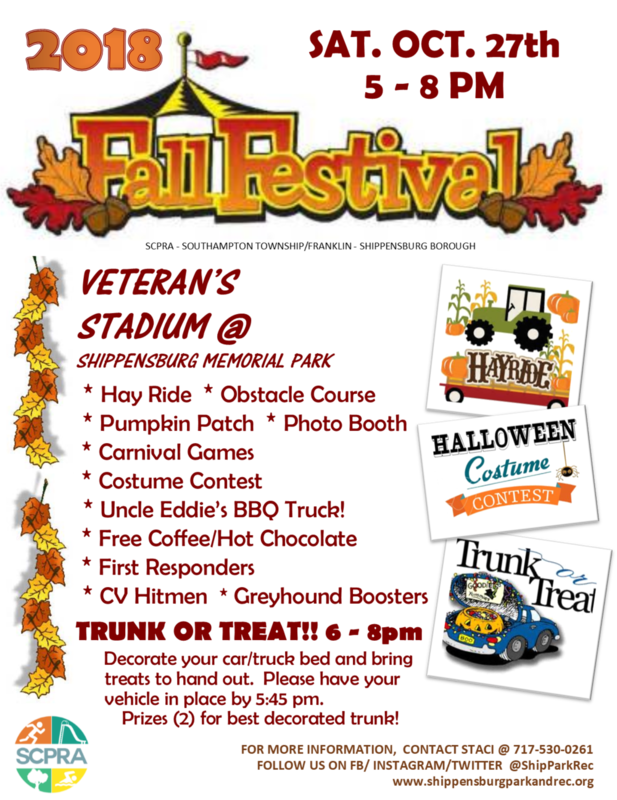 If you are able to volunteer your time the day of the event for set-up, to run a game, or can participate in “Trunk-or-Treat” - please call SCPRA @ 717-530-0261. Thank you!! 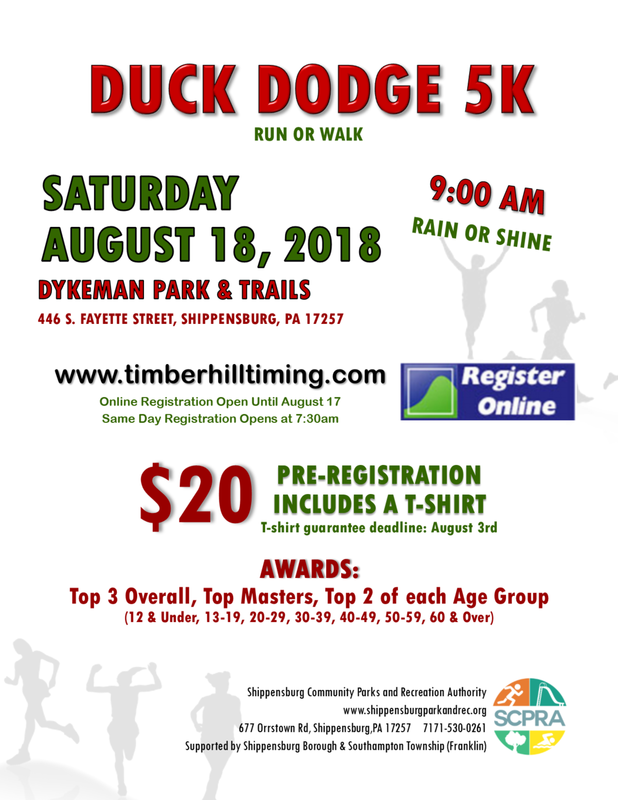 SCPRA's Duck Dodge 5k Run/Walk was held Sat. August 18 at Dykeman Springs Park and Nature Trails. The course was off-road and challenging. It featured rough terrain over hills, through wooded areas and meadows. The sky was a bit overcast and the humidity was high but the weather cooperated for the most part with a slight breeze. Official chip timing was provided by Timber Hill Timing/Garret Stahlman. The Memorial Park Pool will be entering its last weeks of the 2018 season. SCPRA would like to thank all of our members and daily swimmers for spending your summer with us. We hope you had an enjoyable season and we look forward to seeing you in 2019! On June 7, 2018, the Shippensburg Community Parks and Recreation Authority presented it's feasibility study for a possible recreation center at Memorial Park. This is a very broad view of what a recreation center could look like. The following links include an overview, PowerPoint presentation, and blue prints. Further questions can be directed to the SCPRA Main Office located at 677 Orrstown Road. SCPRA Director, Tyler Fairchild, can be reached by phone at 717-530-0261 or email director@shippensburgparkandrec.org. On June 7, 2018, the Shippensburg Community Parks and Recreation Authority presented it's master plan for Veterans Stadium and a new building at the Memorial Park Pool. We would like to thank the many people who came out to hear our presentation. The following links include an overview, PowerPoint presentation, and the blue prints for the buildings. Further questions can be directed to the the SCPRA Main Office located at 677 Orrstown Road. 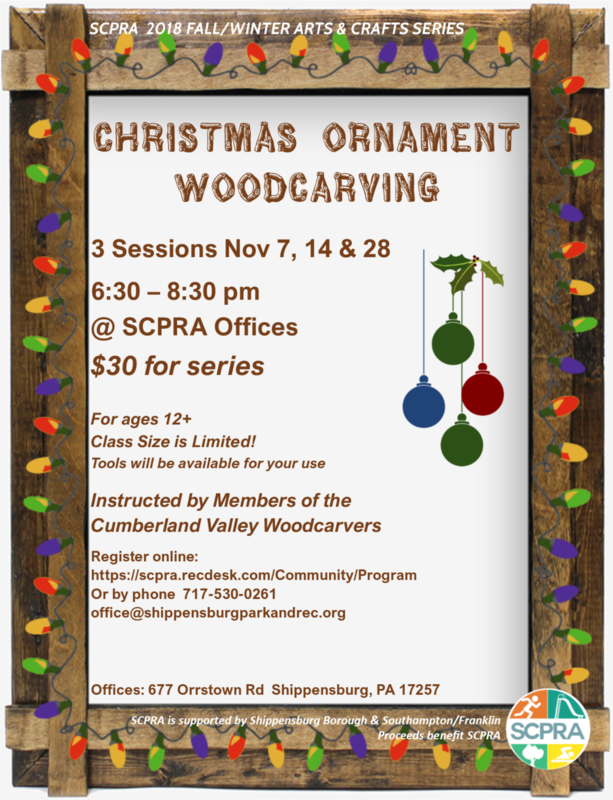 SCPRA Director, Tyler Fairchild, can be reached by phone at 717-530-0261 or email director@shippensburgparkandrec.org. OUR SPRING WALK WILL FOCUS ON THE DUCK POND AREA AND THE IMPACT OF WILDLIFE ON THE LOCAL WATERSHED AND OUR INTERACTION WITH IT. THIS IS A FREE EVENT BUT REGISTRATION IS REQUIRED TO HELP WITH PLANNING AND SUPPLIES! REGISTER HERE. Winter Storm Toby's Snowball Fight! On Thursday, March 22, SCPRA hosted a community snowball fight at Memorial Park. It was a great turnout with about 50-60 participants. Everyone had a great time and enjoyed hot chocolate to close out the night. Thank you to everyone who came!